Time to welcome rising temps and bikinis with a delicious salad from Litehouse Foods! 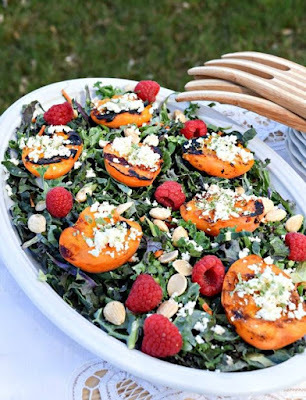 This Grilled Apricot and Feta Kale Salad with Raspberry Lime Vinaigrette Salad combines seasonal scrumptious apricots, kale, raspberries, almonds and feta for a vegetarian delight that feels great even in the thick of summer haze. Because kale holds up so well to dressing, this easy recipe can be made ahead for a dinner party, BBQ or beach getaway. Heat grill to approximately 400 F degrees. Brush cut side of apricot halves with olive oil and place on grates with oiled side of fruit facing down. Grill apricots for approximately 3 – 4 minutes with the grill lid up. When softening and caramelizing, flip apricots over and place approximately one tablespoon of feta cheese crumbles in center and sprinkle with mint. Heat on grill for approximately one more minute or until cheese is warming. Remove apricots from grill and set aside. In large bowl, toss kale with salad dressing, massaging a bit with your fingers to soften leaves. The kale holds up well and can be dressed a few hours earlier, or even overnight, with favorable results. Place dressed kale on serving platter and top with apricots, raspberries, almonds and remaining feta cheese crumbles. I love salads that combine fruits with green and nuts. I,have never tried apricots in a salad. Thanks for,the recipe.